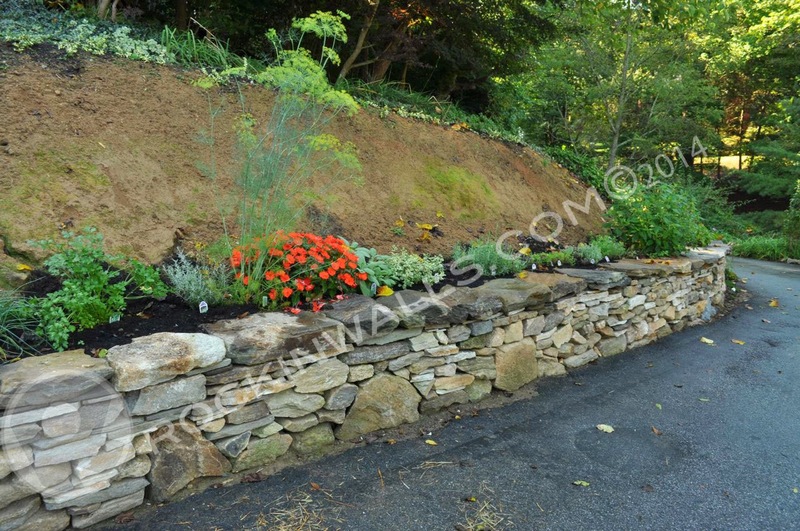 7/2013 Warren Road, Cockeysville Maryland, dry laid stone retaining / sitting wall 35' L x 25" H. Local stone from on site mixed with 1" Butler stone from Vinci Quarry. 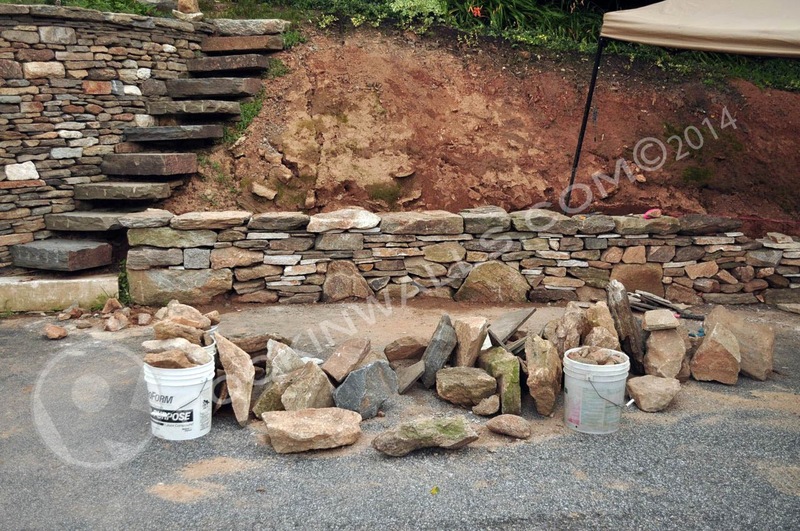 Most of the stone we had left over from the first project was alot of irregular shapes. After just clearing out the bottom layer of old stone foundation. I begin simply setting the stone right on earth. 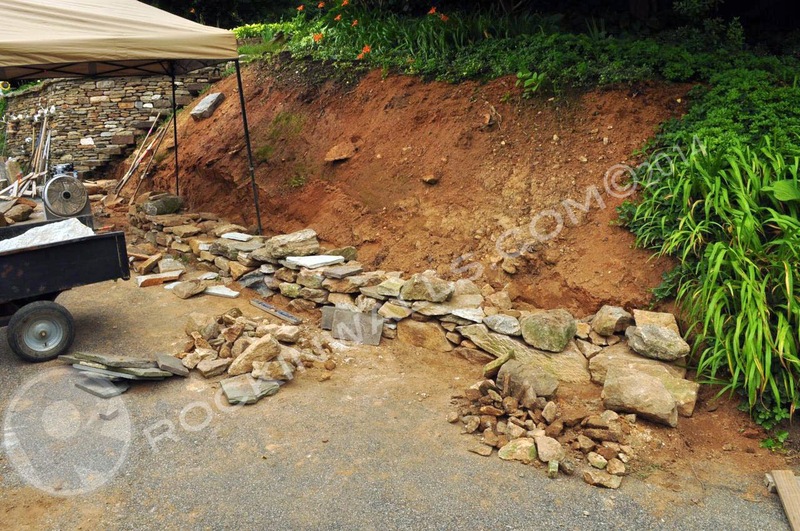 Normally I would do a protruding foundation with the stone set below grade. 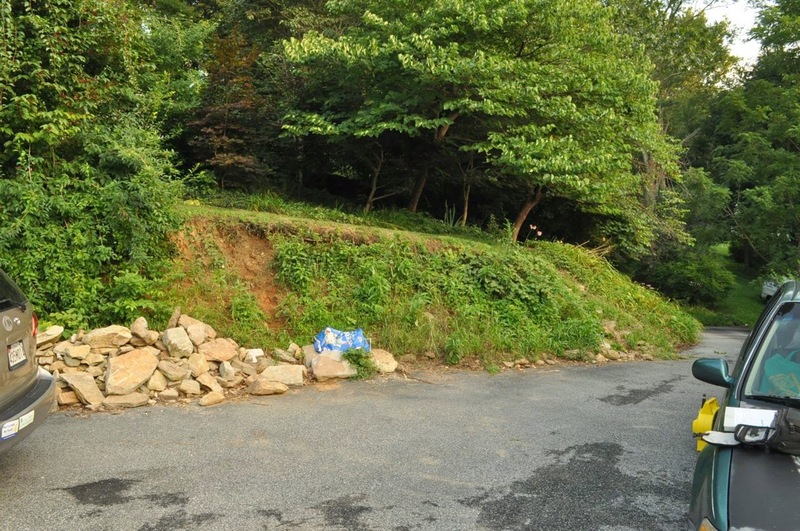 With this project I placed my first foundation stone right on grade. 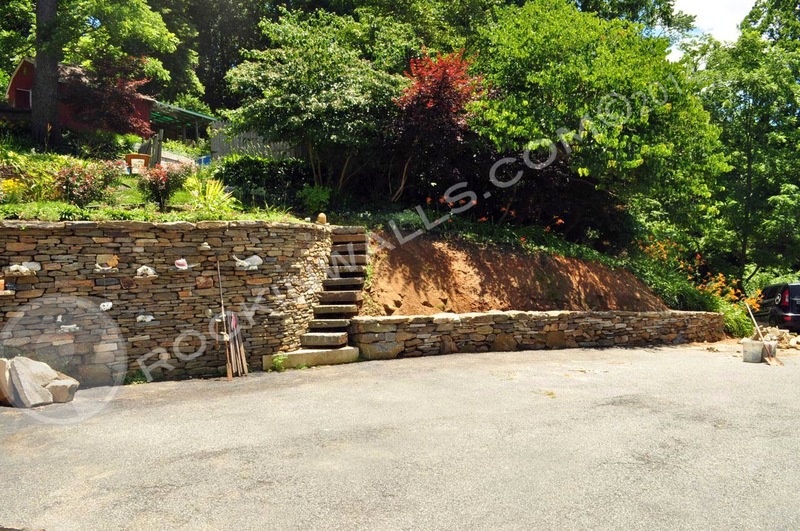 This irregular stone doesn't allow for a protruding foundation. You will also notice I don't have any frames or string lines set up. With this project I offered to the client an hourly rate. 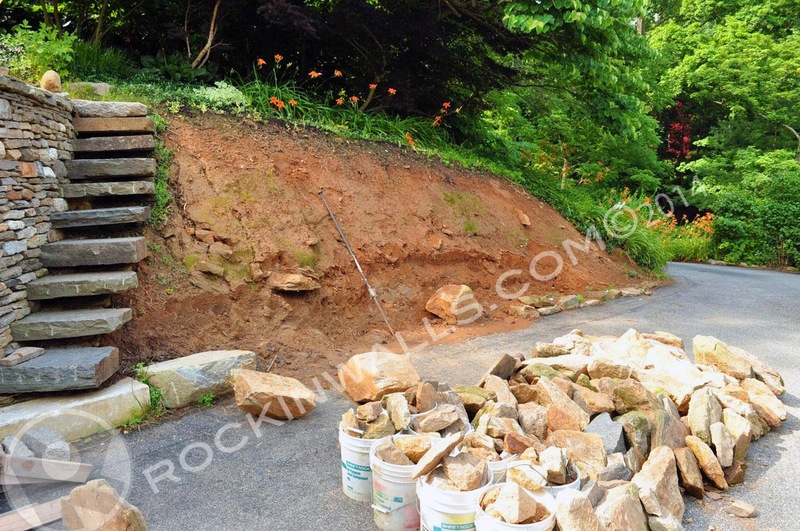 He wanted to have the remaining stone on the driveway used to build a 2' high retaining wall. Since the stone was more irregular - string lines would be extremely helpful. I wanted to let my hair down and test my natural instincts to help guide me. Building with out wall frames can be a challenge. 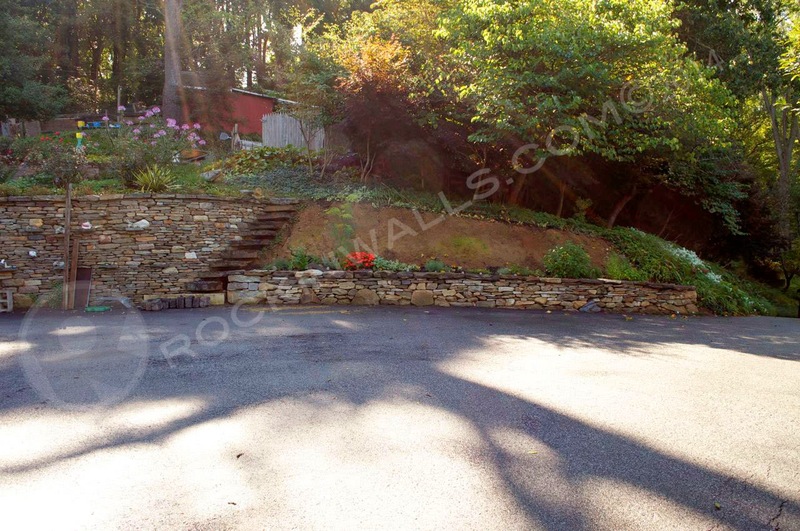 Having the driveway was my guide to follow the shape of the wall. My eyes helped to keep the stones level. 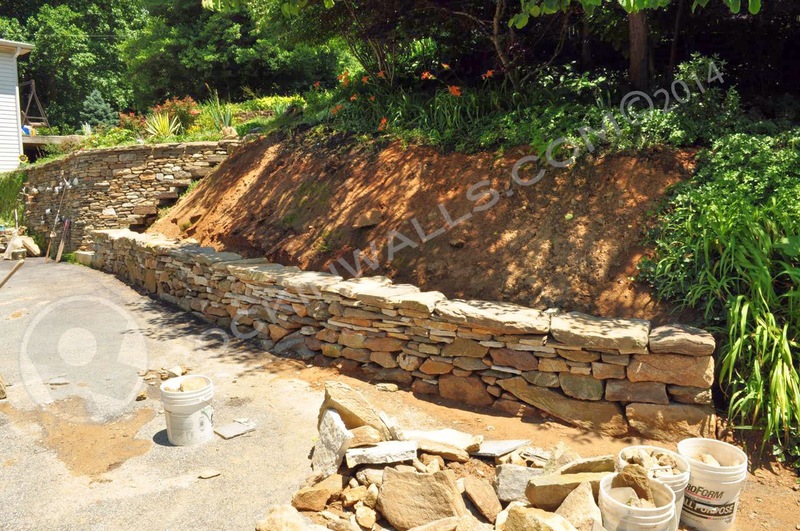 Those who are wallers understand that sometimes you can easily get hung up on focusing to much on the stone instead of the project. What do I mean my letting my hair down? Just go with it. 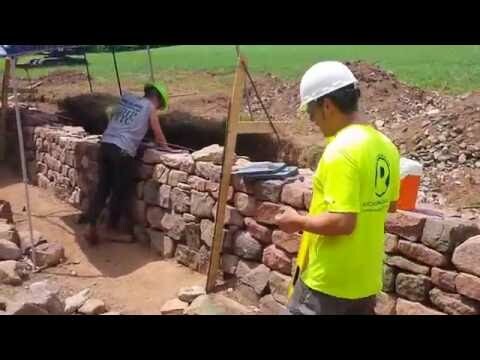 Pick up a stone place a stone - Not second guessing - just build a wall!! - don't focus on the little stuff. This will keep you from being a productive waller. 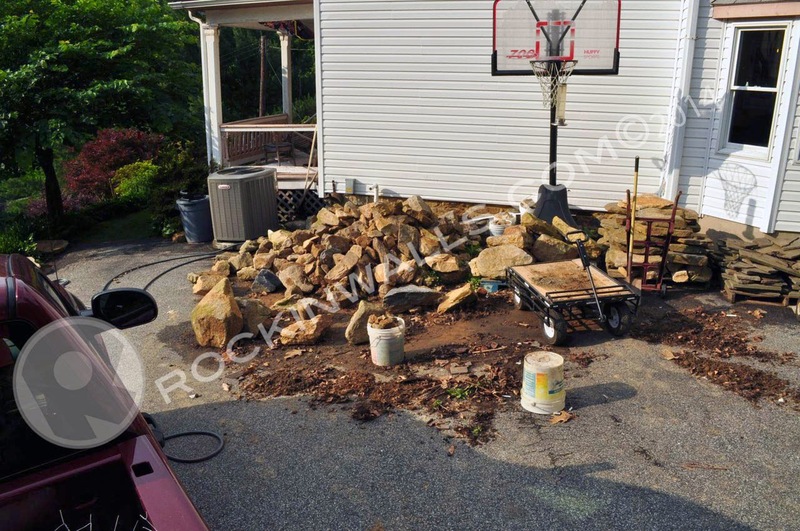 You will see I'm using my wagon and the John has his handy lawn mower with his metal garden cart to move stone. YOU get creative with the equipment you have to help keep your back from to much wear and tear. As a one man show I'm all about equipment that ill help save my body from to much extra labor. As I'm getting to the top of the wall I have now set up a line in order to ensure I build to the same wall weight all the way down. Just a little more stone to go! I love my wagon. Notice the pallets of stone stacked to the right. 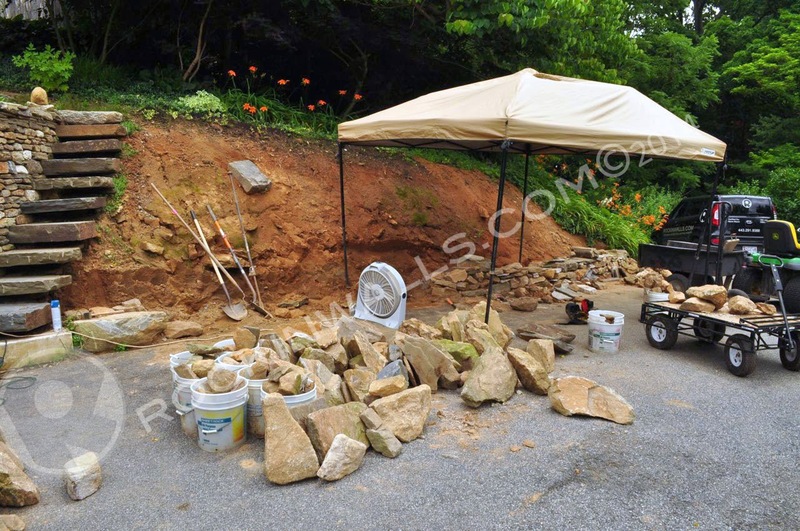 John would be sure to gather up some of the best stones from the pile standing them up on end so I can see at a quick glance what thickness I needed or shape. Start of Day 2, I started setting the cap stones at the end closest to floating steps working in one direction. 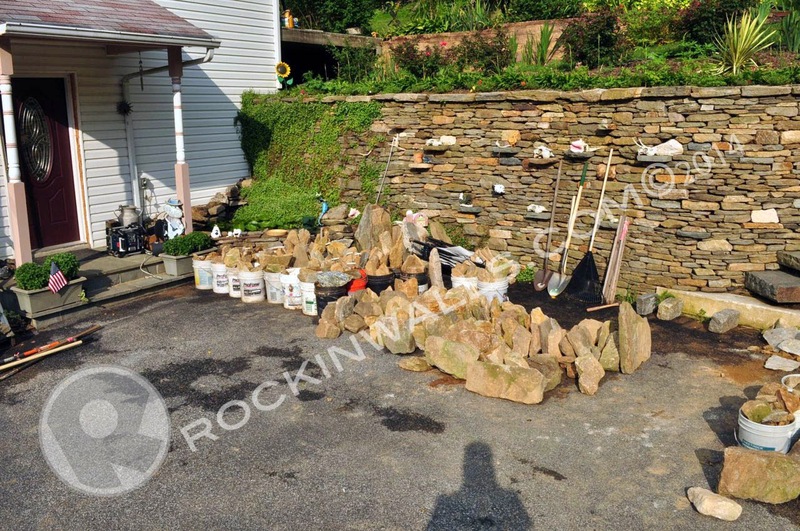 When me and John started we place as many of the larger stones at the bottom of the wall. I really love these three in this section. Building with large stone is the fastest way to gain height. As you will noticed I placed these stone out far enough from each other to be able to build with small stone around them. 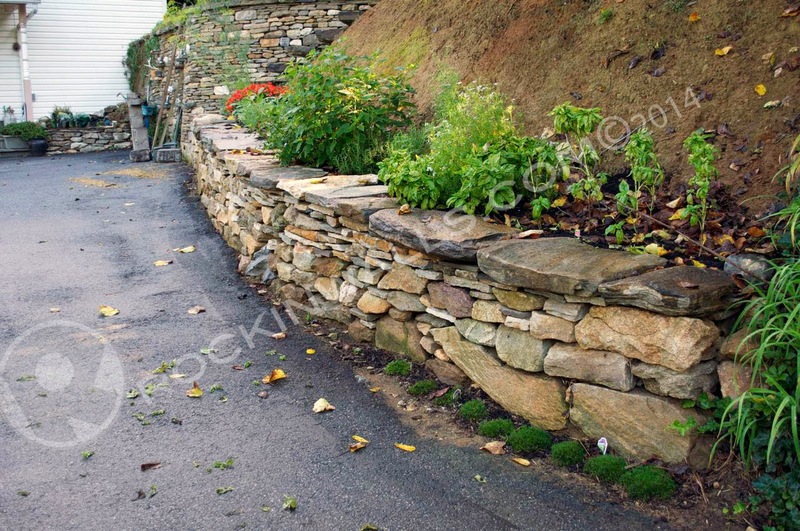 Had I placed them all next to each other - not only would it be hard to fill the voids with smaller stone - they would have visually looked out of place UNLESS all the stone in this wall was the same size. Now not only did I used these up first to get them into the wall but they took up alot of real estate making less work. 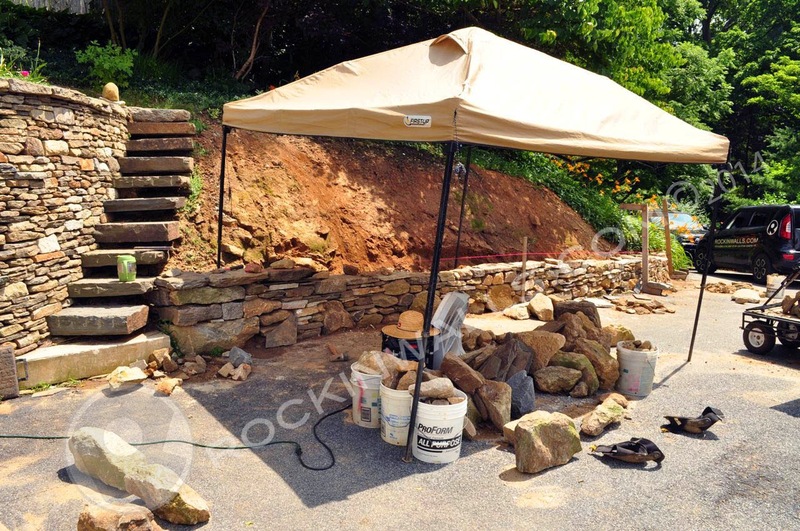 When I had worked on the first wall project (wall to left) I made sure to repack all the stone in order of size and use. Just in case I needed them for the future project like this one - time well spent!!! 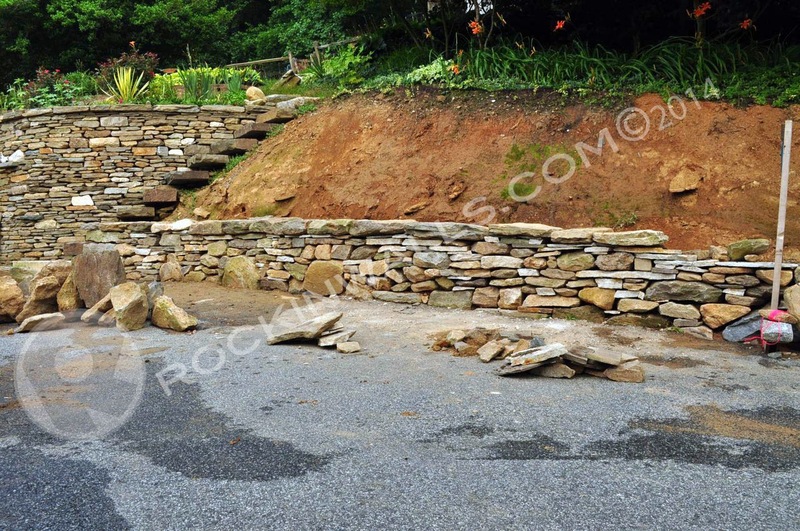 This was a great project for me to focus on speed, quality and not thinking about each and every stone I placed. Forcing me to trust my instincts. The wall has a rustic feel with the larger looser joints. The smaller 1" Bulter stone plates from Vinci Quarry helped as I placed my cap stones to get them to the level I needed. They also matched the first wall. The two projects built within a year and half from each other have a complementary similarity. 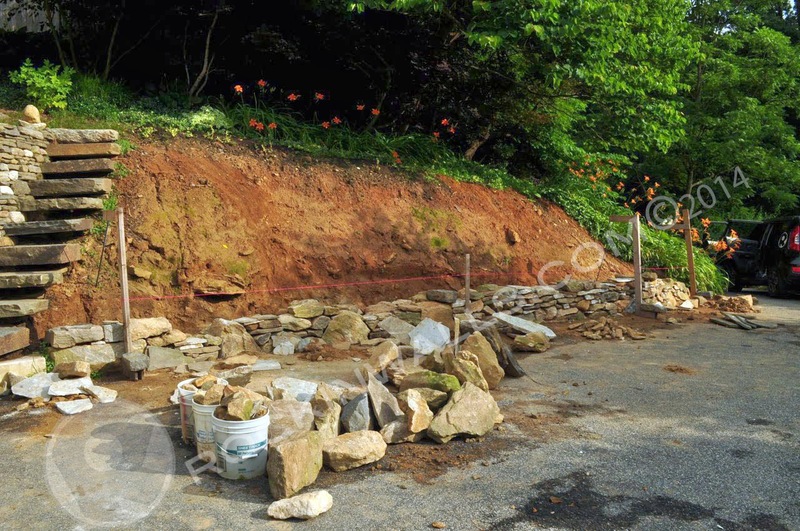 If you look closely you will notice the wall to the left was built with all flat bedded stone - this project (to right) was more irregular or rubble stone with some flat bedded stone mixed in. Well done John and Family with all your plantings. 19 hours ( 2.5 days) total build time. Man that looks good!!! 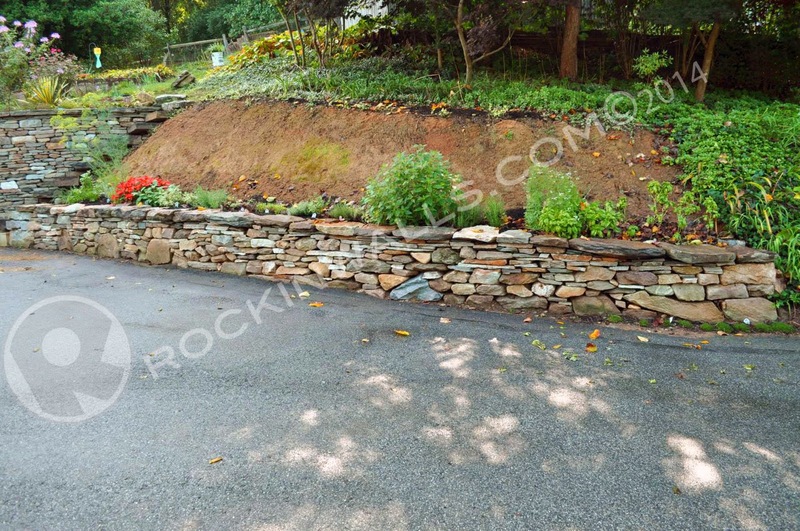 I'm always amazed at the end of each job how a little stone transports an environment. Hello Alf, Thank you for your comment - I'm glad you enjoyed the photo's I enjoy documenting my work because I feel it helps others see things that might help them with their projects. We can all learn from each other. Plus I feel I have nothing to hide by showing how I do what I do. This was an amazing project to work on. I feel so blessed at times to have such incredible clients to work for. Rock on Mark! Keep doing what you're doing. Great pictures too.